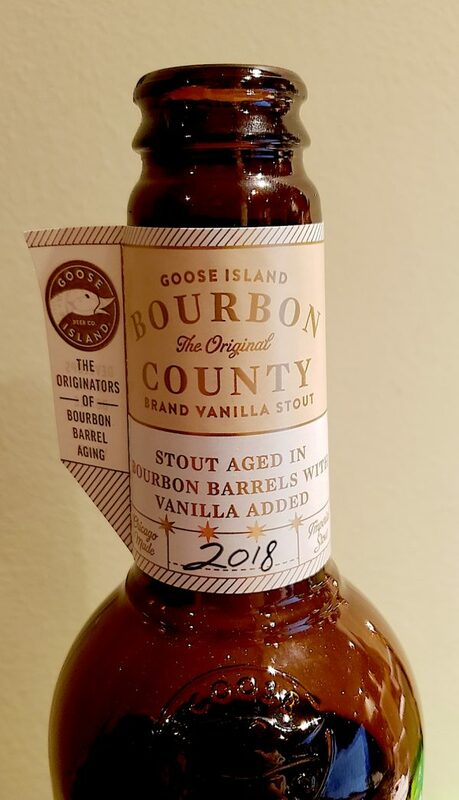 Bourbon County Brand Stout Vanilla 2018 Goose Island On the shoulders of giants! On the banner of this website is a beer glass with the simple expression “Beer is Art” etched on its side. This statement cannot be more true as the ever expanding sea of zymurgists push to create new and interesting culinary twists on this basic ancient brew. As an example, I’ll point to Kim Sturdavant, of San Francisco’s Social Kitchen & Brewery for his creation of a new style called Brut IPA. While Brut IPA may have been introduced by Sturdavant a few years ago, it may very well be the beer that’s created the most buzz in 2018. What’s fascinating about Brut IPA is the addition of an enzyme called amyloglucosidase which minimizes the sugar creating a hoppy champagne-like experience. While many national brewers are still trying to catch up to the New England style hazy IPA, I suspect that we’ll see a plethora of Brut IPA this year as the masses push the style into the mainstream. Craft beer has been a long history of “me too”. Probably the most replicated creative beer genre has been bourbon-barrel aged stout. The first person attributed with putting a beer into a used bourbon barrel to age a beer was Greg Hall from Goose Island Beer Co who did it in 1992. Considering the beer landscape of the time, Hall’s experiment was truly ground breaking and showed that a massive stout could carry the barrel’s influence in a incredibly complementary way. Here we are twenty-six years later and I’m holding a descendant of Hall’s work. In 2014, Goose Island set the secondary beer market on its ear with the release of Vanilla Rye (previously released in 2010). Within an instant, the 2014 bottles were selling for between $200 to $300. This release is not the same as the 2014 release as it uses different barrels (from Heaven Hill) and is aged on Madagascar Vanilla beans. I’ll note the original retail price of this 2018 bottle was $25 and supply was ample enough not to fuel a vigorous secondary market. Goose Island Bourbon County Brand Stout Vanilla, totally fascinating…like half stout, half cream soda. Lots of other complexity below that creamy vanilla like layers of chocolate, dark fruit, tobacco and finishing with a sharp boozy heat. That booziness does detract and this rambunctious stout will need a little cellar time to smooth out the edges. The label suggests that it will continue to mature for five years in the bottle and that’s what I intend to do with the other bottle I bought. While the popular community sites have this bottle of 2018 Goose Island Bourbon County Brand Stout Vanilla at around 97 – 98, I’m not that enthusiastic — at least right now. While I’d say right now, this is a 92, I’ll check in on this one again in a couple of years, I suspect it will be epic. This entry was posted in All Beers and tagged bourbon barrel aged, Bourbon County Brand Stout, Goose Island by Administrator. Bookmark the permalink.